The brother in arms for Zanbaku. 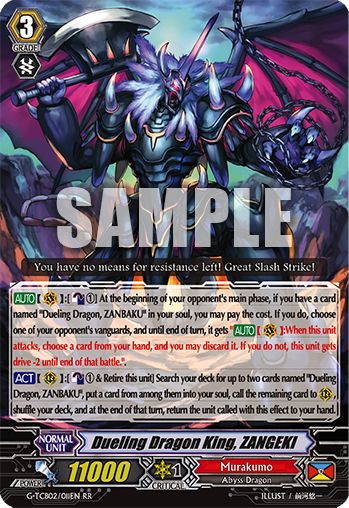 [AUTO](VC):[Counter Blast (1)] At the beginning of your opponent’s main phase, if you have a card named “Dueling Dragon, ZANBAKU” in your soul, you may pay the cost. If you do, choose one of your opponent’s vanguards, and until end of turn, it gets “[AUTO](VC):When this unit attacks, choose a card from your hand, and you may discard it. If you do not, this unit gets drive -2 until end of that battle.”. [ACT](RC):[Counter Blast (1) & Retire this unit] Search your deck for up to two cards named “Dueling Dragon, ZANBAKU”, put a card from among them into your soul, call the remaining card to (RC), shuffle your deck, and at the end of that turn, return the unit called with this effect to your hand.